Audi has created diesel fuel by combining air, diesel and renewably sourced energy. The fuel, dubbed Audi E-diesel, can be mixed with conventional diesel, or can be used to fuel combustion engines alone. 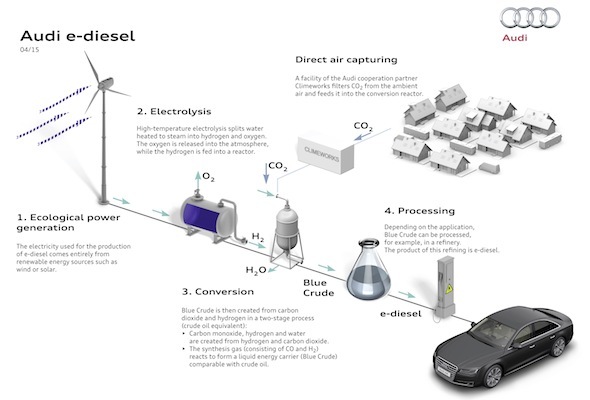 The process of conjuring diesel almost literally from thin air, which is detailed in the above image, involves combining CO2 – largely sourced from Biogas facilities – with water that has been broken down into its hydrogen and oxygen components through high-temperature electrolysis. The reactive product, known as Blue Crude, has similar properties to conventional crude oil and can be refined to create E-diesel. The development of carbon-neutral fuels is significant both in the fight against climate change and also in the development of sustainable mobility, provided the energy used in the process is renewably generated. Prof Dr Johanna Wanka, Germany's minister of education and research, commented: "This synthetic diesel, made using CO2, is a huge success for our sustainability research. If we can make widespread use of CO2 as a raw material, we will make a crucial contribution to climate protection and the efficient use of resources, and put the fundamentals of the 'green economy' in place." To prove the fuel works as intended, Prof Wanka poured the first gallon produced into her government car, an Audi A8 3.0 TDI diesel. Since opening in November last year, Audi's fuel plant in Dresden has just started to produce fuel of a high enough quality to be used in vehicles. Around 3,000 litres of Audi E-diesel are expected to be produced in the coming months.